I’ve been working hard over the past few years to incorporate as many late-blooming pollinator friendly plants into my landscape as possible. Not only do I enjoy the punch of color they provide from September until November, I also love seeing the diversity of pollinators they attract and support. 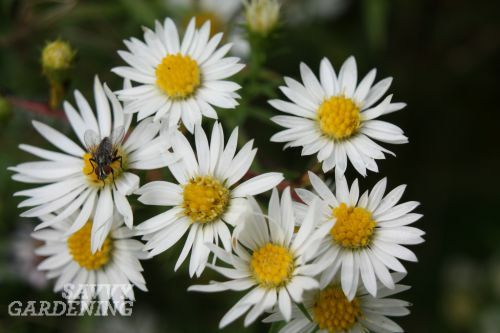 Providing nectar for pollinating insects as diverse as native bees and butterflies, tachinid flies and beetles, these pollinator friendly plants really know how to keep the garden buzzing with life well into the autumn. Plant them in your garden and you too can help support your local pollinators. 1. Boltonia (B. asteroides) is a North American native that bears profuse, inch-wide, daisy-like flowers late in the season. It’s nice and tall – topping out around four feet – and looks great in the back of the border. Plant it in full sun for best results. ‘Snowbank’ is the variety shown in the picture. Oh, and that’s a good guy fly on the left! 2. 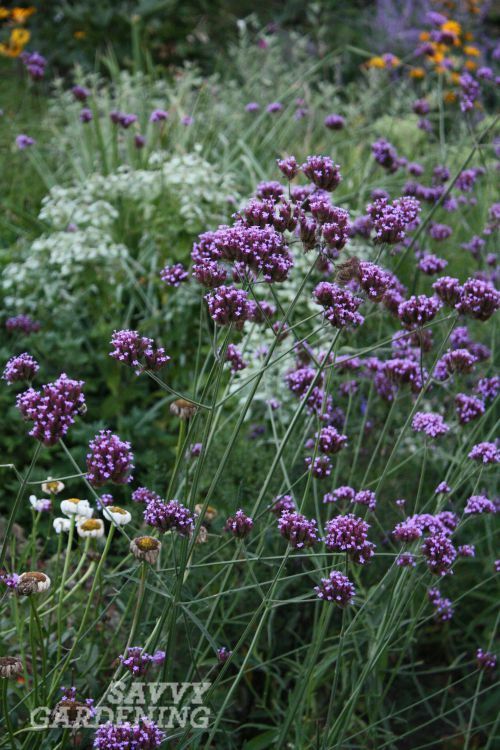 Purple top vervain (Verbena bonariensis) is an annual that’s native to South America. It’s a prolific self-sower that comes up in my garden every year. The butterflies and bees adore it. I love the skeletal structure of this plant. The tiny, tubular, purple flowers are borne in clusters atop the slender flowering stems. 3. 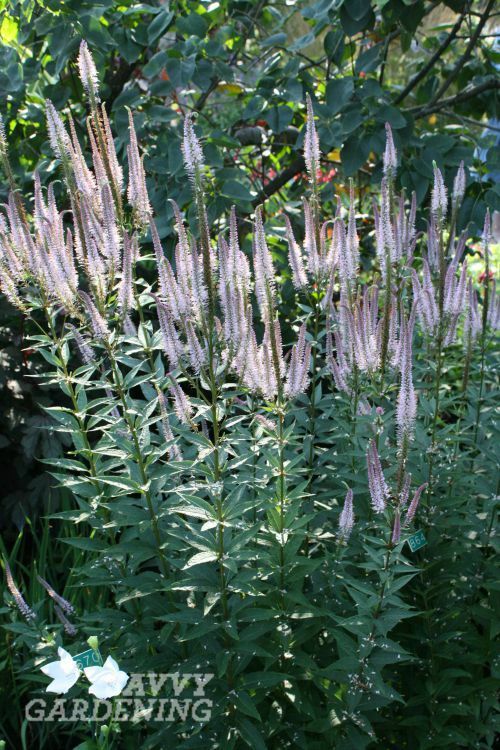 Culver’s root (Veronicastrum virginicum) is a hardy perennial in USDA zones 3-8 and is native to North America. It reaches a height of nearly five feet in my garden, and the striking candelabra-like flowers are magnets for many different pollinators. This pale pink selection, called ‘Pink Glow’, is slightly different from the common white form. 4. 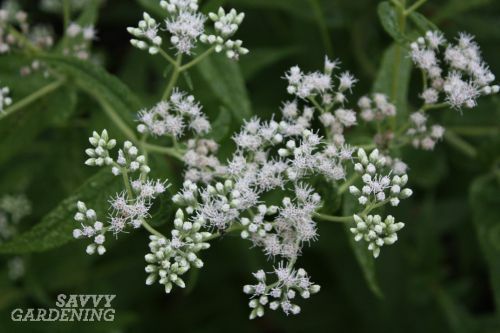 Common boneset (Eupatorium perfoliatum) is a truly important plant to late-season pollinators. Its white, fluffy blooms were found to host a broad diversity of pollinators in a recent native plant trial at Michigan State University. It prefers average to wet soil and thrives in my garden with little care. 5. Asters (Symphyotrichum spp.) are another important perennial for pollinators from late summer through fall. 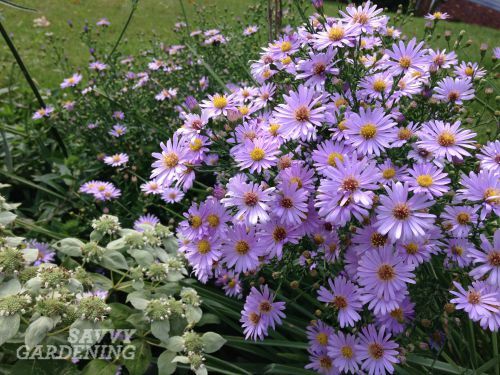 There are over ninety species of asters native to North America, many of which have dozens of named cultivars. They’re ultra-appealing to pollinators because they have a user-friendly floral structure and they keep on producing nectar and pollen for weeks on end. Be sure to check out this video for details on three more great plants for pollinators. Related post: Rudbeckias: Powerhouse plants! What late-blooming pollinator friendly plants do you include in your garden? Tell us about them in the comment section below. I have a row of Sedum next to my raspberry patch that turns a wonderful autumn red. The most honeybees I see all year are concentrated around them (bumblebees like raspberries more). I think I may have seen a Monarch butterfly or two ( maybe a Viceroy) but they definitely attract pollinators. The succulent part is green near year round, and the bloom stalks are good over wintering spots. We also include Rose of Sharon ( hardy hibiscus ), varieties of cranesbill ( hardy geraniums ), dwarf perennial foxgloves, echinacea, sedum, glorious a daisies, hardy fuschia, coreopsis, lobelia, re blooming daylilies, re blooming primulas in our zone 5A garden in Nova Scotia. Many of my neighbours also have the white flowering varieties of hostas which are a later blooming variety. Our yard is still a buzz in late September with pollinators. I love Caryopteris. A pop of blue/purple in late summer and fall, and the bees just love it!